Personalized Monthly Planner w/ Pen. 2 Tone Leather-Look Covers. Promotional, Inexpensive. Brown and Chocolate with Gold Flat Pen. Best price in USA and Canada. 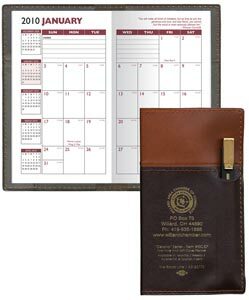 Economy Personalized Monthly Planner with Pen and Leather-Look 2-Tione Covers. We also supply blank (not imprinted) Monthly Pen Planners at EQP (End Quantity Price). Lowest cost in USA and Canadafor promotional Monthly Planners with Pens. American clients pay no taxes. Setup Charge: $40.00 per order (No Setup Charg on repeat orders). 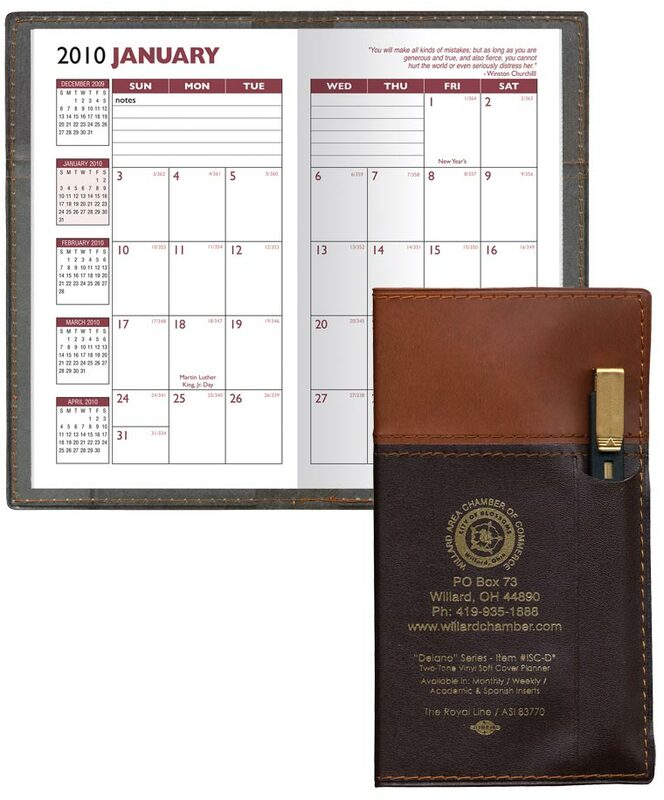 Two-Tone Premium Delano Vinyl (Leather Immitation) Cover Planner with Flat Gold Pen has a 32 page monthy insert that shows one month on a two page spread. The planner inside runs 14 months from December through January. It includes pages for important phone numbers and dates as well as advance planning areas. Also included are metric conversion charts, a time zone map, area code table as well as an important holidays page. Colors: Brown and Chocolate (2 tone) with Flat Gold Pan. Gift Box- $0.48, shipped separately. For insertion add - $0.20 per Montly Planner.